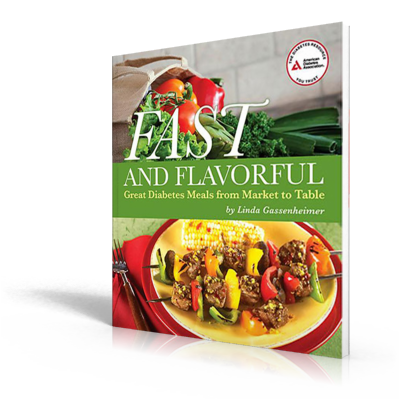 New from the ADA- Fast and Flavorful, Great Diabetes Meals from Market to Table by Linda Gassenheimer, producer and host of Food, News and Views on NPR and the Miami Herald column "Dinner in Minutes". The book features quickly prepared recipes for two, with shopping lists and preparation times for the recipes, as well as a list of calories, fats, cholesterol, sodium, carbohydrate, dietary fiber, sugars, protein and exchange list. Of course, you can double or triple the recipes for more people. There are delicious recipes for soups, salads and entrees listed in sections featuring seafood, poultry, pork, beef, veal & lamb and vegetarian meals. Try the Marsala-Glazed Chicken with Roman Spinach with a preparation time of only 15 minutes! How about Mediterranean Steak with Minted Couscous or Pistachio Crusted Beef? Salmon Gazpacho?